So you’ve heard about the 2016 Nissan Pathfinder’s exciting technologies, which are designed to keep you informed, entertained, and engaged throughout your trip. You’ve also learned that the Pathfinder is designed with your safety in mind, featuring a slew of safety devices meant to ensure your protection no matter the conditions or the situation. But did you know that the Pathfinder also boasts epic engine power and impressive performance features? Get the lowdown by reading on! Powered by a 3.5L V6 engine, the Pathfinder can generate an unbelievable 260 hp as well as 240 lb-ft of torque, meaning that you’re going to enjoy ample power on drives both long and short. Similarly, the Pathfinder also boasts a truly mind-bending towing capacity, allowing drivers to lug 5,000 pounds of boat, trailer, or whatever you choose up to the lake, down state, or simply around town. Not only is the Pathfinder a powerful vehicle, but it’s also highly efficient, giving drivers as much as 20 mpg in cities and 27 mpg on highways, depending on how it’s outfitted, and allowing you to save money and to do the best for the environment. Likewise, the Pathfinder features an Xtronic Continuously Variable Transmission system that gives you one of the smoothest drives around while also helping drive up the vehicle’s efficiency rate. Finally, the Pathfinder comes equipped with an All-Mode 4×4-i intuitive 4WD system that ensures unbeatable driving control, meaning that, no matter whether you’re stuck in the most harrowing weather conditions or out-backing it off-road, you’ll have unrivaled traction. 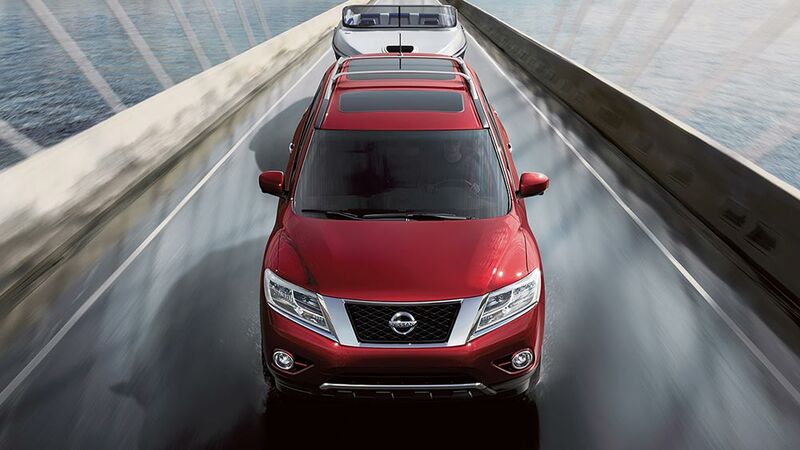 Experience the Nissan Pathfinder Today! Best of all, you can take the Pathfinder out for a test drive today by visiting our Sorg Nissan dealership at 2845 N Detroit St in Warsaw. On the other hand, you can also give us a quick call at 574-267-5850 to arrange a visit, or get in touch via this online form. Don’t wait any longer: visit Sorg Nissan today and explore the high-powered performance of the Nisan Pathfinder!